Today we feature two different takes on the power of your voice. “Clara Vox” came to me while I was stuck in a low-paying job writing copy without meaningful opportunities to use my talents to their fullest extent. At the time, being able to write felt like having one of those ironic gifts from the gods you read about in Greek mythology: eternal life without eternal youth, the uncontrollable ability to turn everything into gold, perfect prophecies that no one else will believe, that sort of thing. In L. Timmel Duchamp’s classic science fiction story “The Forbidden Words of Margaret A.” (from which today’s title comes), a black female dissident’s words are so inflammatory and radical that the government puts her into quarantine on a military base and passes a law (The Limited Censorship for the Preservation of National Security Act) to systematically and completely obliterate them. In her quest to meet with Margaret A., the reporter-narrator meets a “Justice Department official assigned to what they call ‘the Margaret A. Desk’—an ‘expert’ who cheerfully admitted to me that he had never heard or read any of Margaret A.’s words himself.” In a story deeply engaged with the power and danger of women’s voices, and women of color’s voices especially, the reader never finds out what Margaret A. advocated for, or indeed her full name, which functions to keep the focus on her silencing, and on what may happen when inevitably the next generation pushes for the law to be overturned. Duchamp may have been thinking of political prisoners like South African anti-apartheid activist Nelson Mandela or Myanmar’s pro-democracy politician Aung San Suu Kyi, who were both imprisoned by their respective governments when the story was first published in 1990. However, the text itself allows for Margaret A. to be an ordinary woman making mundane observations about oppression, who happened to hit the cultural zeitgeist at a particular moment of cultural change, like the one we are living through now with the #metoo movement. The narrator expects to meet “not only the most remarkable woman in history, but probably the most charismatic, charming and possibly lovable person I would ever have the pleasure of knowing,” and is startled to find instead a “a small stout figure in gray cotton shirt and pants” whose interview is a “disappointment.” Many ordinary women have had the experience of pointing out seemingly obvious gender bias and having their words treated (mostly—but sadly not exclusively—by men) as inappropriate and out of line. 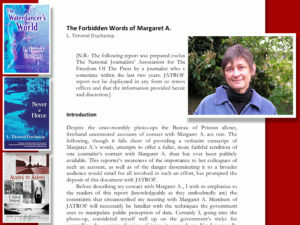 Margaret A.’s imprisonment is this reflexive patriarchal silencing writ large. R. S. Benedict grew up in rural New York but spent three years living in China. Her work has appeared in Unicorn Booty and The Magazine of Fantasy & Science Fiction. L. Timmel Duchamp is the author of several books, including The Waterdancer’s World and Never at Home. 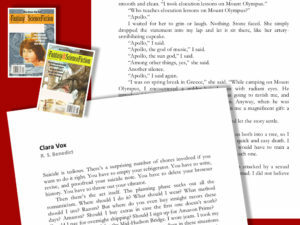 Her five-novel Marq’ssan Cycle series was awarded a Special Honor by the 2009 James Tiptree, Jr. Award jury. 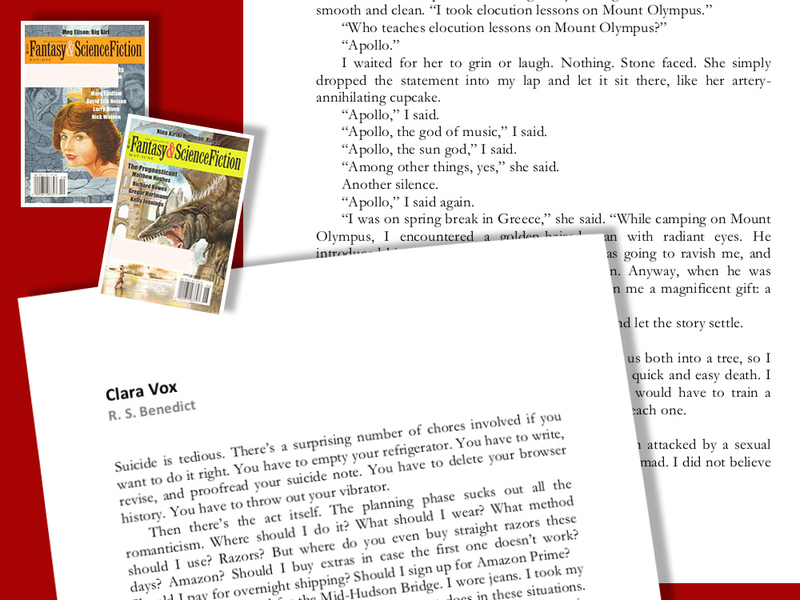 In 2004, she founded Aqueduct Press, which now claims the lion’s share of her time and effort and won her the 2017 World Fantasy Special Award—Professional. She lives in Seattle. Find her at ltimmelduchamp.com. 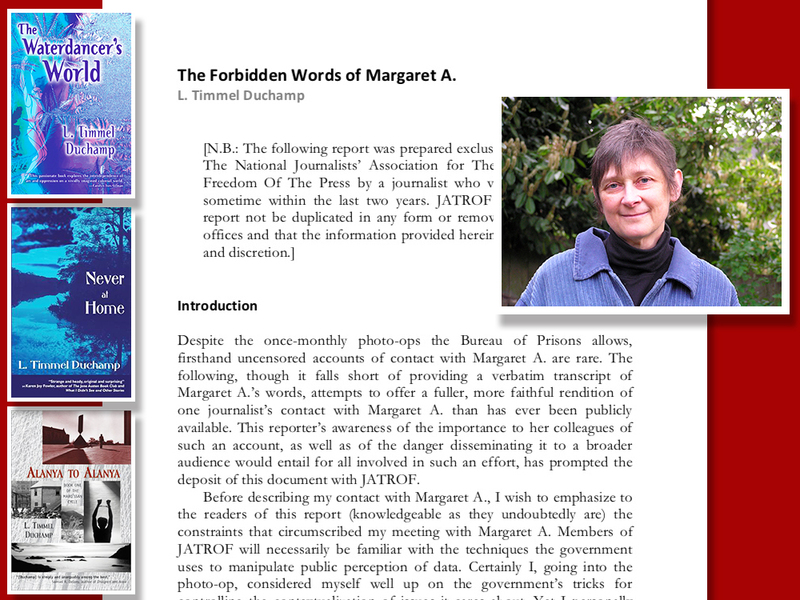 Her “The Forbidden Words of Margaret A.” was first published in Pulphouse 8 and has been anthologized in The Women Who Walk Through Fire and Sisters of the Revolution: A Feminist Speculative Fiction Anthology. Entry filed under: Anthology, Fiction, News. Tags: L. Timmel Duchamp, R. S. Benedict, women up to no good. There’s a slight green sheen. Not from the lichen or whatever, just normal rot. I thought you understood about transformation.